Begin by pouring paint that has been thoroughly mixed into a bucket. Use a quality brush, 2”-2.5” wide and made of nylon/polyester, to begin the job. The best outdoor conditions for painting are when you can work out of direct sunlight in temperatures between 50 and 90 degrees F, with moderate humidity, as hot weather and penetrating sun can cause paint to dry too quickly. If you must work in very warm, humid weather, be sure to double your drying time on the first coat before applying the second coat. Doing so will help you avoid peeling paint, which can occur due to collection of moisture under the first coat. Also, never paint just before a rainstorm, as the falling water can wash away your finish and leave paint unprotected and dull. Begin with the top panel of the garage door and paint into the recessed area. Be sure to paint recessed areas by beginning at the corner and continuing around the perimeter until the entire panel is complete. Repeat this process until each panel and recess is complete. Wipe away any paint that has run over onto the stiles. Using your brush, paint around the perimeter of your garage door, painting a 2”- 3” wide section and beginning at the top corner, moving along the walls. Next, pour paint into your paint tray and reload your roller for the next section. Use a ⅜” – ¾” roller cover for best results. Paint around the perimeter of each panel, continuing until the garage door is complete. Once again using your brush, paint the inside frame of the door by beginning at the top of the frame and continuing until frame is complete. Wipe excess paint from the trim. Next, begin at the top corner of the door and paint the side edge to where it meets the wall. Paint all edges until the trim is complete. Nothing chips away at the visual impact of your home more than a worn-down paint job. 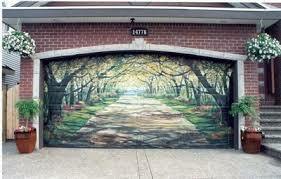 By adding a new coat of paint, you improve the appearance of not just your garage but your entire property. Be sure to paint during the correct weather conditions and remember to follow the above painting process to ensure a long-lasting finish.